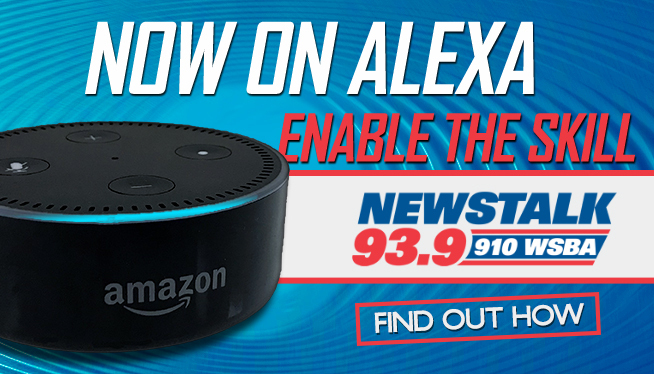 NewsTalk 93.9 is now available on Amazon devices with Alexa. Start your weekday mornings with WSBA Morning News hosted by Gary Sutton, followed by Brian Kilmeade, the Rush Limbaugh Show, Ben Shapiro, The Mark Levin Show, and then The Savage Nation hosted by Michael Savage. Also, catch Doug Stephan, Andre Viette, Dave Ramsey and others on your weekends, all available anytime on your Echo, Echo Dot, Echo Show, or any other Alexa-enabled device. OR Set up NewsTalk 93.9 on your smartphone with the Alexa App. Search for “NewsTalk 93.9”. Tap on the station logo to get to NewsTalk 93.9 skill. Tap “Enable” to enable NewsTalk 93.9 skill.